This is the topic of conversation around here and exactly what our guests want to know as they arrive at the inn. Sometimes that question comes up during the reservation process and it pleases us to have so many amazing choices we can recommend. One thing about St Augustine’s historic district is all the good eats, good coffee, amazing attractions and hundreds of shops are all within walking distance from us. When you book a stay with the Agustin, you have truly come to an amazing place! Location, location location… We’ve got that and when it comes to tasty food we also have you covered! Pictured here is one of our most asked-for breakfasts made in the Agustin kitchen. 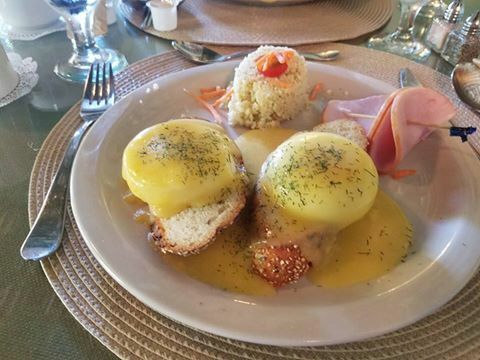 That would be our famous Eggs Benedict! What are the best restaurants in St Augustine you ask? We are happy to name a few for you right here and of course we’ll lead you in the right direction as you venture outside our front door after checking in or perhaps after you have filled up on our two-course breakfast in the a.m. and are ready for the next meal! Although our city is almost 452 years old, our charm remains and our restaurants never get old or predictable! Here are some of our favorite best restaurants in St. Augustine! Here are five descriptions to make your mouth water in no particular order of best. They are all fabulous! Café Alcazar – Part of St. Augustine (in some form) since 1888, this establishment is full of history. Once called The Hotel Alcazar and now Lightner Museum, was home to the world’s largest indoor swimming pool. Nowadays, the deep end of the former swimming pool holds the cafe that is open daily for lunch. Menu items include escargot, curried chicken salad sandwich, shrimp Giovanni and a Florida favorite, key lime pie. Most dishes range from $8-$15. The Floridian -The Floridian’s owner and chef husband-and wife team, Jeff McNally and Genie Kepner have embraced not only native ingredients but Florida’s Southern foods heritage as well but strive to offer some of the freshest options. The grit cakes, for example, is fried polenta topped with seasonal salsa ($8) and the Shrimp and Sausage Pilau ($16) is made with local shrimp sauteed with onions and peppers and simmered in a spicy Datil-tomato and sausage “gravy.” The Floridian makes a great effort to provide lots of vegetarian and vegan options such as the ‘n Grits, which can be ordered with the traditional remoulade shrimp or tofu ($14). The seasonal Florida Sunshine salad with Florida strawberries, roasted sweet potatoes and candied pecans has the option of being topped with tempeh ($13). There are even gluten free options on the menu. Michael’s Tasting Room – This happens to be our next-door neighbor and partner for our Annual Bed and Breakfast Holiday Tour! This is a great fit for St. Augustine, a city full of Spanish influence. The fare is inspired by the Mediterranean region and traditional Spanish cuisine, In addition to the dishes that range from tapas to entrees/big plates, this restaurant has an extensive, award-winning wine list. 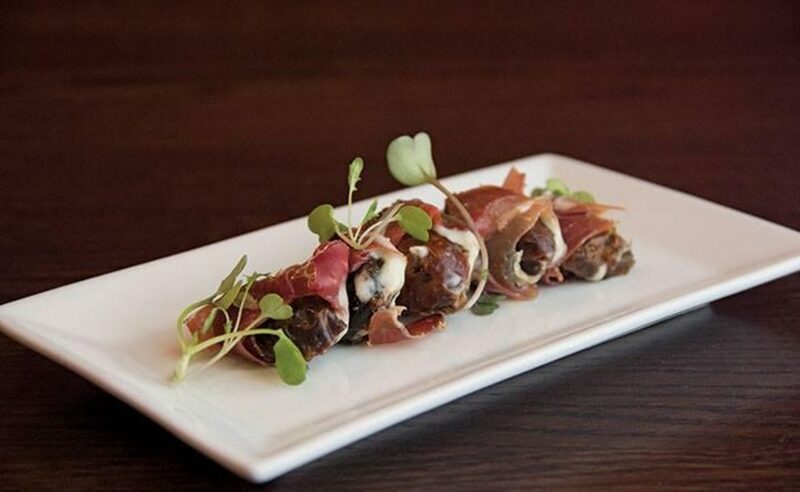 Seasonal and expertly sourced meats and seafood are always the focus and served with gorgeous presentation. To compliment your meal, choose from over 70 different Spanish wines, with several available in tasting flights. Add to that some authentic, live Spanish music and you have the perfect atmosphere for a romantic dinner or special occasion. 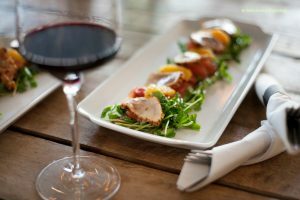 Catch 27 – This has become one of the most talked about sea food restaurants and on the best restaurants in St Augustine list! Their dedication to serving fresh, locally caught seafood from Florida water along with seasonal ingredients and local produce makes the menu outstanding. The atmosphere is chic and modern but casual. For lunch, try the seared blue crab cake sandwich or shrimp tacos, both $12. Not in the mood for seafood? You also have a choice of a Cuban sandwich or the lemon chicken sandwich, which are both amazing! The Ice Plant – This cool (pun not intended) distillery that makes award-winning craft spirits in house is also an excellent restaurant with a funky, old-fashioned hipster vibe. Come for lunch and have an Old City Melt with Gruyére, mozzarella, cheddar, tomato and caramelized onion on multigrain bread ($9) or the meatloaf sandwich ($13). Bar snacks to go with your craft cocktail include smoked fish dip and bacon wrapped dates. Dinner entree range from $14 for the burger to $28 for the pan-seared scallops with Handmade black pepper tagliatelle pasta.Of course you have to have a cocktail made with their New World Gin or Distillery Vodka. The Ice Plant is open until 2 a.m. by the way if you are looking for a late night!